Tang dynasty, 8th or early 9th century A.D. If you did not know this was an image of Prince Gautama, you might think it was painting of a Chinese prince. The top half shows the prince leaving the east gate of the city and encountering an elderly person whom he asks about. The lower half shows him exiting the south gate of the city and encountering an ill person whom again he asks about. 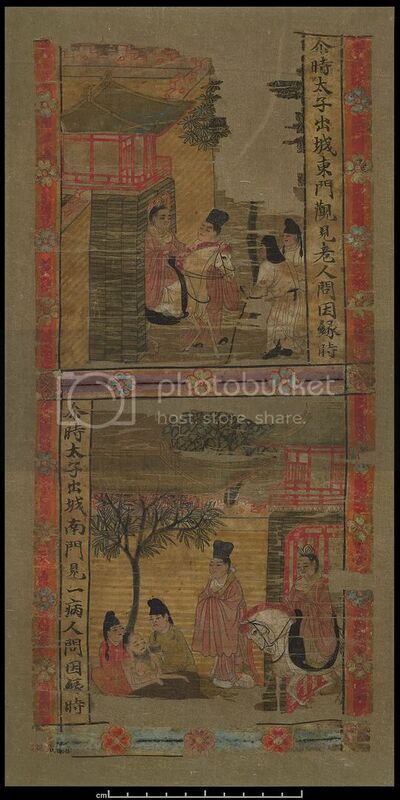 This painting is particularly interesting to me because it shows how someone in the Tang Dynasty envisioned the content of the texts that he or she would have been reading. It goes without saying that what they imagined was something a lot closer to home. The prince looks like a Tang prince and both the scenery and characters likewise reflect the time period when the work was painted. Again in this other painting we see a clearly Chinese depiction of the Indian prince. Tang dynasty, 8th- early 9th century A.D. It is interesting in the middle scene that we can see one Indian looking character distinguished from the others who are dressed in Chinese garb. The artist surely was exposed to statues of Buddhas and Bodhisattvas, but interestingly they don't portray all the characters in such a style.